Sgt. 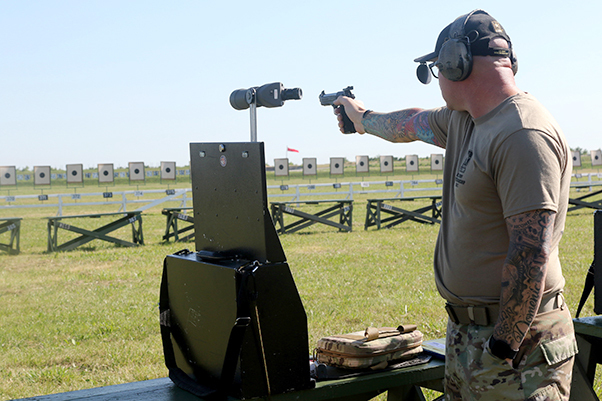 1st Class Patrick Franks, a U.S. Army Marksmanship Unit Service Pistol Team Soldier, fires his pistol at Camp Perry, Ohio during the National Pistol Matches. The pistol matches are an annual competitive pistol shooting event sponsored by the Civilian Marksmanship Program and open to civilians, veterans, law enforcement, and servicemembers from all military components. Each year, USAMU Soldiers offer the Small Arms Firing School at Camp Perry (before the matches) to teach both pistol and rifle safety and marksmanship to attendees. Franks, who hails from Las Vegas, Nevada and acted as the team captain, competed with fellow Soldiers to win the National Trophy Pistol Team title, which USAMU has now won for the past 11 years.